Perhaps there is no better example of Queen Anne architecture in metropolitan Detroit than the home you see. Jerome Croul and his brother earned their fortune selling woolens and animals skins in Detroit. Croul came to Detroit and helped establish the Parson and Croul firm that sold woolens and sheepskins. Then Jerome Croul and his brother went into tanning and set up the Croul Brothers Leather Works. Jerome Croul also had a strong interest in public safety and served as Detroit's fire commissioner from 1872 to 1888. Francis Palms, an immigrant who came to Detroit in 1832 from Antwerp, became a real estate developer. The first generation of wealthy individuals in Detroit built their homes very close to the city center, many of them between the present Jefferson Avenue and the Detroit River. Palms encouraged building along East Jefferson and helped to develop it as prestigious. Palms built his own home on East Jefferson in 1846. The Beaubien Home, dating from 1851 at 553 East Jefferson is probably the style of elegant housing that Francis Palms promoted. 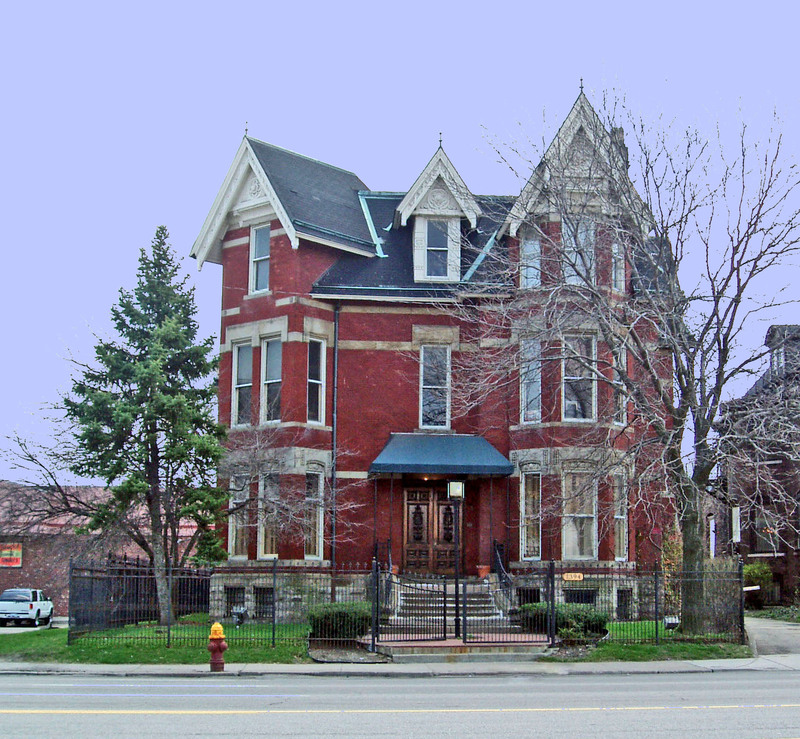 Jerome Croul commissioned successful Detroit architect, William Scott, to design an elegant home in the then popular Queen Anne style. This is the home you see, one that was completed in 1881. This is a red brick home with extensive limestone trim. Note that it sits on a substantial rock-faced stone platform. The roof is many planed with numerous dormers, gables and chimney caps. Note the imposing three-story bay windows facing East Jefferson. When originally built, there was a two-story brick barn or stable linked to the house you see. Presumably, Mr. Croul's carriage and horses were there along, perhaps, with a stable man. The barn was razed but much of the remainder of the home probably resembles what architect Scott designed during the waning years of the Hayes administration. Jerome Croul sold this home to Francis and Celimene Palms in 1887. This Francis Palms was the son of the Belgian immigrant who began to develop East Jefferson. Since 1880, the younger Mr. Palms had been working in his father's real estate business. Mr. Palms lived in this home until his death in 1905 and his wife lived here until she died in 1913. By that time, other relatives were continuing the real estate and development business. This is the firm that built the impressive State Theater building on Woodward across from the new Comerica Park. The Palms family continued to own this home until 1945, but by that time, it had been converted into a 25-room boarding house. In 1954, it was remodeled into eight apartments. Twenty-nine years later it was renovated once again, this time into an attractive Queen Anne style office building.